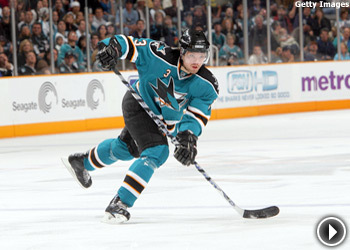 San Jose Sharks defenseman Doug Murray's nickname is "Crankshaft". There are many famous hockey nicknames. "The Great One," "Mr. Hockey," and "The Golden Jet" have come to symbolize the players they describe -- Wayne Gretzky, Gordie Howe and Bobby Hull, respectively. While most of today's players don't have immediately recognizable monikers, most NHL players have some sort of nickname. Alternate names are part of the fabric of hockey, almost as old as the game itself. The bulk of these nicknames, however, are simple and derived from the sound of a player's name, such as Colin "Whitey" White or Dany "Heater" Heatley. Yet, there remain a few nicknames that show the creativity necessary to stand the test of time and enter the lexicon of the sport's more colorful nom de guerres. Usually the genesis of the colorful nicknames is as entertaining and creative as the name itself. Some players get their nicknames as young kids and lug them throughout their career. Other times, the names have been given during their NHL career. Occasionally, a player's nickname will come from something that has nothing whatsoever to do with hockey. The origin of others remains somewhat of a mystery to this day. San Jose defenseman Doug "Crankshaft" Murray -- Murray wouldn't reveal the full story behind his nickname, but he is an energetic defenseman for the Sharks and contributes in all three zones. "I have a lot of energy and I have to keep everyone going," Murray said. "It comes from me having a lot of energy. My former teammate, Grant Stevenson, came up with it when we used to live together." 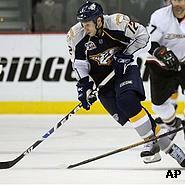 Players also will shorten a nickname so they can get the player's attention quickly on the ice. Murray's nickname, though, still remains somewhat of a mystery. "Sometimes they call me 'Cranky,'" Murray said. "But I'm far from cranky. I'm not a mechanic or anything, so it doesn't come from there. There's a little mystery to it." San Jose defenseman Marc-Edouard Vlasic "Pickles" -- Vlasic, 20, got his nickname because he shares a name with the famous Vlasic pickle company. Vlasic, who is in his second NHL season, was tagged with his nickname during a preseason game for the American Hockey League's Worchester Sharks. "I was about to play my first exhibition game in Fresno, and the coach of Worcester, Roy Sommer, gave it to me," Vlasic said. "He said everybody's name in the starting lineup, and when it came to my name, he said; 'Pickles,' and nobody knew who he was talking about, so he explained it to me." Vlasic said nobody picked up the pickle link when he was younger because Vlasic didn't sell pickles in Montreal until recently. Los Angeles left wing Kyle "Grease" Calder -- Calder, selected No. 130 overall in the 1997 Entry Draft, beat long odds just to make it to the NHL, and earned his moniker from his style of play. "It (my nickname) was given to me because of the way I play on the ice," Calder said. "Being able to spin off the checks down low and stuff like that." Calder got his nickname at a young age and it has stayed with him. Atlanta center Erik "Crusher" Christensen -- Christensen, part of the package the Penguins traded to the Atlanta Thrashers late last month for star right wing Marian Hossa, is one of the League's best shootout performers. Christensen's nickname has been with him since middle school. The 24-year-old is stymied about where the name came from, but knows it didn't come from hockey and it isn't very fitting of his soft-spoken personality. "I got my nickname in Grade 8," Christensen said. "It's not hockey-related and a couple of my long-time friends gave it to me. I'm not sure why they gave it to me because it doesn't fit my personality." Atlanta goalie Johan "Moose" Hedberg -- Hedberg emerged as the Penguins' starting goalie in the 2001 Stanley Cup Playoffs after playing with the Manitoba Moose of the original International Hockey League. Since there was no time to get a new helmet, Hedberg kept wearing the moose-adorned helmet he used in Manitoba. "When I came to Pittsburgh from the Manitoba Moose, I still had my old mask, which had a moose on it," Hedberg said. "I just kept playing with that mask. The fans in Pittsburgh started it by chanting 'Moose,' and it stuck." Hedberg has continued to decorate his helmet with a moose ever since. "I kept the moose on my helmet in different shapes as a good-luck charm," he said. Minnesota right wing Mark "Grumpy" Parrish -- Parrish, who has played more than 650 games in his 10-season NHL career, is a sound two-way player for Minnesota coach Jacques Lemaire. Parrish can score and set up goals, but he isn't much to talk to in the morning, which is where his nickname comes from. "I'm not much of a morning person," Parrish said. "I'm grumpy in the morning and my teammates always tell me how unfriendly I am in the morning." Scott Nichol's nickname evolved from his name to "Scooter". Nashville center Scott "Scooter" Nichol -- Nichol, part of one of the most underrated forward units in the League, is not one of Nashville's most skilled players, but the 33-year-old plays a reliable game for coach Barry Trotz. Like many NHL nicknames, Nichol's came from his name, but still has a unique quality to it. "It just sort of evolved from Scott to Scotty to Scooter," Nichol said. "I also do scoot around the ice a little bit. I can't pinpoint where I got the nickname or who gave it to me, though." New Jersey center John "Mad Dog" Madden -- Madden, one of the League's best defensive forwards, always has played an intense game, ever since his rough upbringing in the urban suburbs of Toronto. Even though Madden can't recall the root of his nickname, it comes from his hard-working style of play. "I don't know exactly how it came about," Madden said. "I remember as a kid everybody just called me 'Mad Dog,' and it stuck." His nickname became solidified during his time playing at the University of Michigan. "It really started to stick in college," Madden said. "When Branch, which was a stick company, shipped my sticks and they said 'Mad Dog' on them and it just took off from there. I think it comes from the intense way that I play. Guys are always telling me to drink decaf before the game because I get so hyped up." 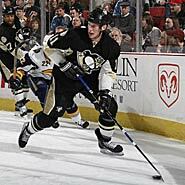 Pittsburgh center Jordan "Gronk" Staal -- In his second NHL season with the Penguins, Staal has two brothers playing in the League and another who is eligible for the 2008 Entry Draft. Staal's former teammate, Colby Armstrong, coined the nickname for the 6-foot-4, 220-pounder. Jordan Staal's nickname is "Gronk" because he's big and lanky on the ice. "Colby Armstrong gave it to me and it has stuck with me," Staal said. "I think it's pretty funny. Armstrong noticed that I was a big, lanky guy out there on the ice and then he started calling me 'Gronk.'" Armstrong, traded to Atlanta last month, explained the unusual nickname this way. "He's huge, he's like a big monster," said Armstrong, who is no mite at 6-2 and 190 pounds. "We used to call a kid I played with in junior (hockey) 'Gronk' because he was a huge guy like Staal; so that's why I started calling him 'Gronk.'" Philadelphia defenseman Jason "Gator" Smith -- The Flyers' captain, Smith is one of Philadelphia's most dependable defensemen and plays a stay-at-home style. Smith stands 6-foot-3, weighs 215 pounds and is one of the more intimidating and physical Flyers. He gets his nickname from a fondness for the University of Florida Gators football team. Smith originally became a Gators fan through a close friend, and the nickname has become popular with teammates since it first emerged.